Ideal Storage for Daily/Weekly Use of Dehydrated Foods! 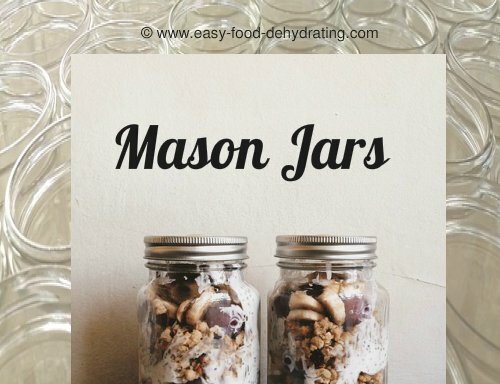 I love to use mason jars to store my dehydrated fruit and vegetables in. They are airtight – and can be easily kept on your pantry shelves in the kitchen, and behind closed doors, which keeps direct light off them also, which is a good thing! I use these air-tight jars for every-day use – when I'm ready to make a quick soup, or need to add some dehydrated vegetables to a recipe, I can quickly add some dehydrated vegetables without having to mess around preparing fresh vegetables. (Don't get me wrong, I'll take fresh vegetables over dehydrated any day, but we're all about doing this for long-term storage). By keeping the dehydrated vegetables in the jars, it means I'm not opening up my Mylar bags all the time to retrieve a vacuumed packet and having to re-seal the Mylar bag afterward. Have a look at the home page, and you can see my actual dehydrated goodies in one of my kitchen cupboards! :-) Plus they look great on your shelves. Impress your friends and family! You can use smaller air-tight jars for items that you don't use a lot of — such as garlic, and spices. 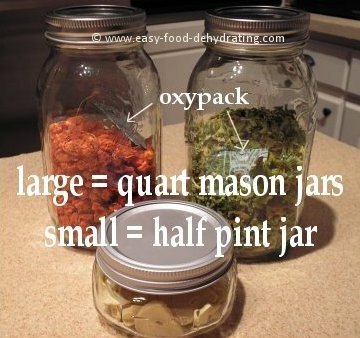 Mason Jars – Great For Long-Term Storage! I like the fact that they are made of glass; not only can you see the contents in the jar, you can see at a glance how much is left! When you're ready to refill your jars from your stock, just go pick out one from your stash of stored Mylar bags. Open it, take out a packet (or two) and reseal the Mylar bag, and refill your jar! Important: Do not forget to sterilize your jars before use. It Can't Get Much Easier Than This! We also need to have a 100cc oxypack in the jar, and an easy way to tell if the oxypack is 'worn out' is when you take the lid off ... If the lid opens without a popping sound, you will need to replace the old pack with a new one. NOTE: I'll keep the 'old' 100cc oxypack and put that in the smaller jars (the jars I use for the elephant garlic and spices). Even though they may not have much 'life' left in the old oxypacks, there's probably enough life left in them for the small jars until you cannot feel any air-pop-resistance at all!